Still getting over last night but there are eight other games this round, I'll try to distract myself with them. 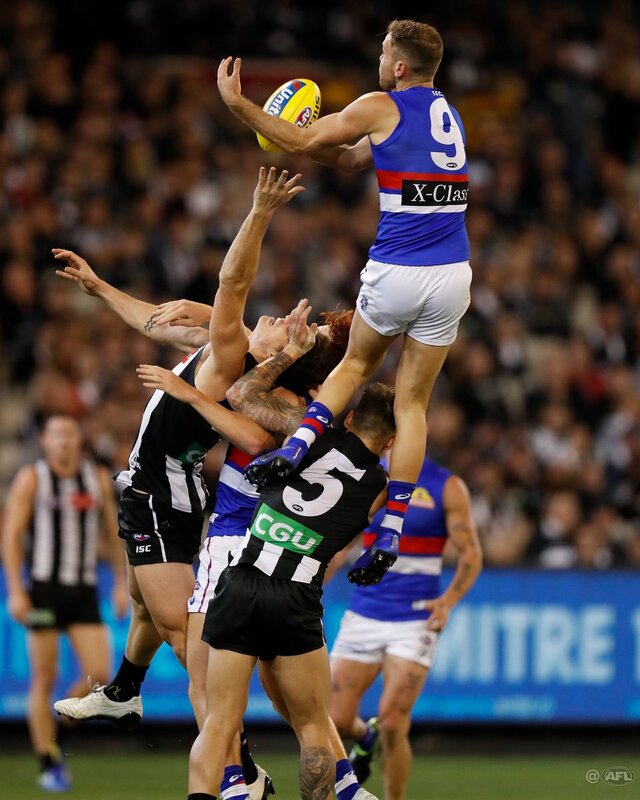 Collingwood v Dogs tonight, going as expected.....and who cares? Cats v Giants should be a good game and I've tipped the Saints to beat the Hawks as a 'roughie'. The Dogs playing with their old tsunami and fab grabs, it’s a beaut contest..
Yeah, it looked good live but was far less impressive when you studied the replays. Anybody's game at the moment but Bulldogs playing the better. Yes, I would rate McCarthy's mark last week, as more of a challenger to Heeney. 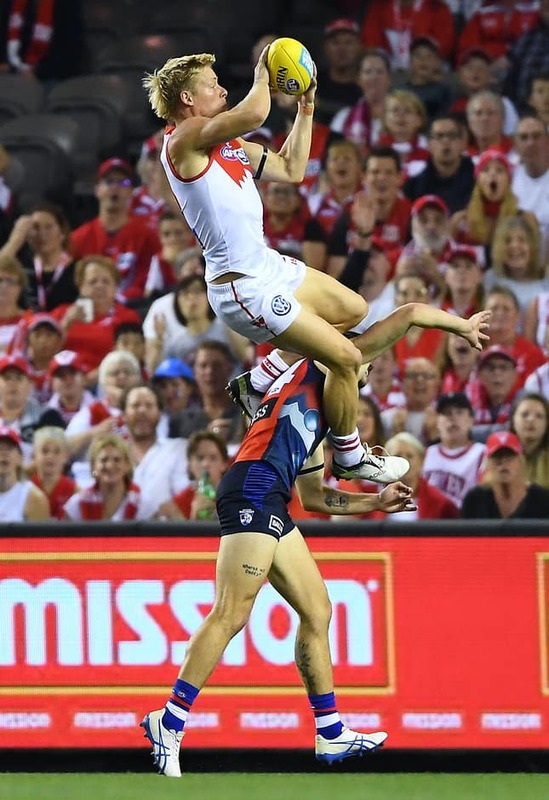 Cleaner than Crozier's, although the height was given a bit of a boost, when the Port player beneath him also attempted to jump, seemingly not realising that McCarthy was already on his shoulders. There's no doubt Heeney's, McCarthy's and Crozier's are the three best so far this season....pardon my bias but I still think Heeney's is the best. Judge for yourself......each as high but one is a first grab v a fumbler. .....and one has to realise that Crozier is on Elliot's shoulders.....and he is a shortarse. Wow....after a lightening start, the Cats have faded to lose their first game of the season by 4 points. Which wrecks our record of being the only team to beat Geelong at home in 35 games.....three times mind you! Lions having their first bad game against the Bombers but it's not over yet.....and they've kicked the first of the last in 50 seconds but seven minutes in now and no addition to either score. I've come to the conclusion that the new rules suit teams with dominant ruckmen and fast midfields. I was doubtful of GWS resurrecting the mummy, but it looks an inspired move. Also.. hopefully this is the last we hear of winx. Geez maybe we are not as bad as everyone thinks. Freo late in the 4th kicked 4.13 and both weagles and Freo atrocious skills. Watching Freo play is a bit like us!